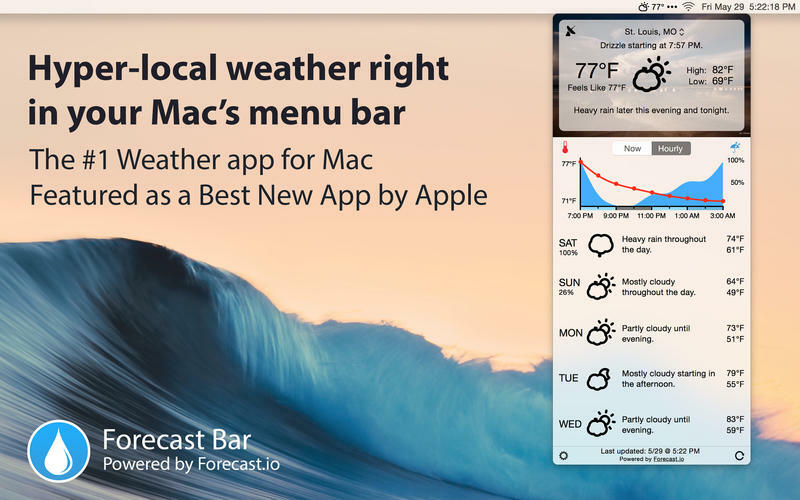 Forecast Bar 1.5.1 – Hyper accurate, hyper local live weather and forecasts right in your menu bar. Powered by Forecast.io, Forecast Bar offers hyper accurate, hyper local live weather and forecasts right in your menu bar. With beautiful background images matching current weather conditions and time of day along with a simple and clean interface you will find yourself checking the weather non-stop! Next story GoodSync 5.1.2 – Backup and file synchronization software. Previous story FontExplorer X Pro 5.0 – Font management software. Motion Weather 4K 1.1.2 – 4K-video wallpaper based on your weather. Forecast Bar 2.6.4 – Accurate, local live weather and forecasts.